The most important thing to think about when purchasing pedestal tables is the top material. Aluminum tables are lightweight and extremely sturdy. Since they're so durable, they usually come with a lifetime guarantee. Plus, aluminum is a recyclable resource. Laminate tables are a great solution if price is an issue. High-pressure laminate is bonded to a particleboard or plywood core. These are more affordable than aluminum tables and offer guarantees for five to 12 years. While not nearly as important as tabletop material, frame material is a consideration. As a general rule, aluminum is lighter and more resistant to rusting and corrosion than steel, while steel tends to be less expensive, less affected by intense heat and able to support heavier loads than aluminum. Standard – A 29-inch high table is your most versatile choice, because you can use it with most of your existing school or office chairs. At 42 inches, stool-height tables work great with café chairs and stools. These taller tables and chairs give your room a more contemporary feel. Adjustable tables, which are usually more expensive, switch from stool- to standard- height with the use of a hand crank or hydraulic lift. 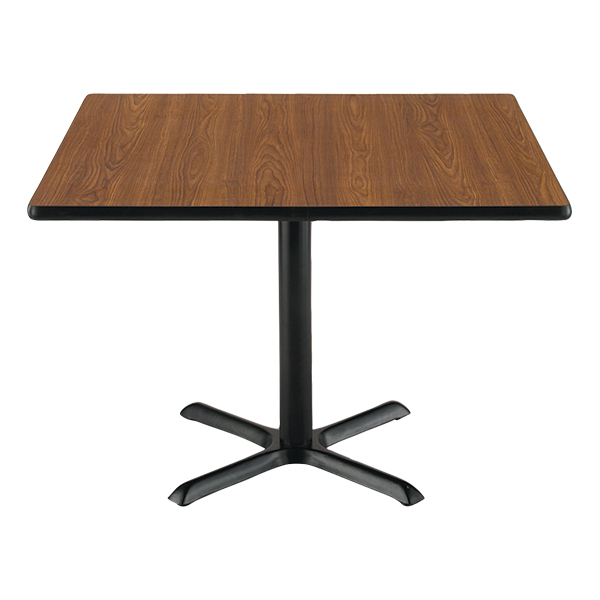 You'll even find adjustable-height ADA pedestal tables for students in wheelchairs. 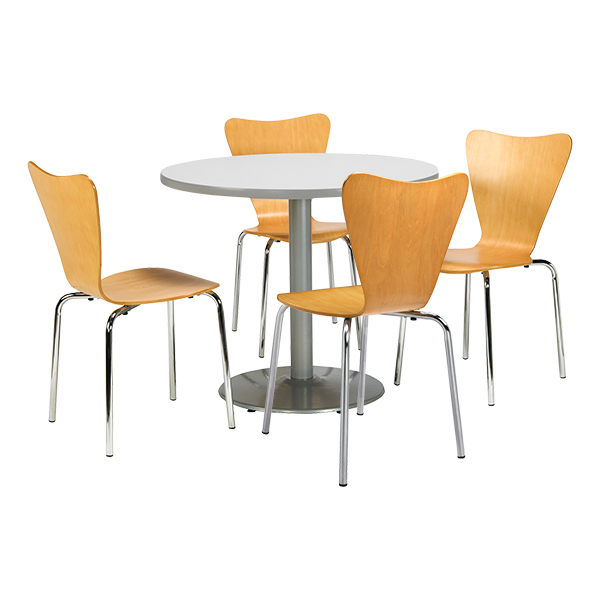 Seating Capacity is typically determined by the shape and size of the table. 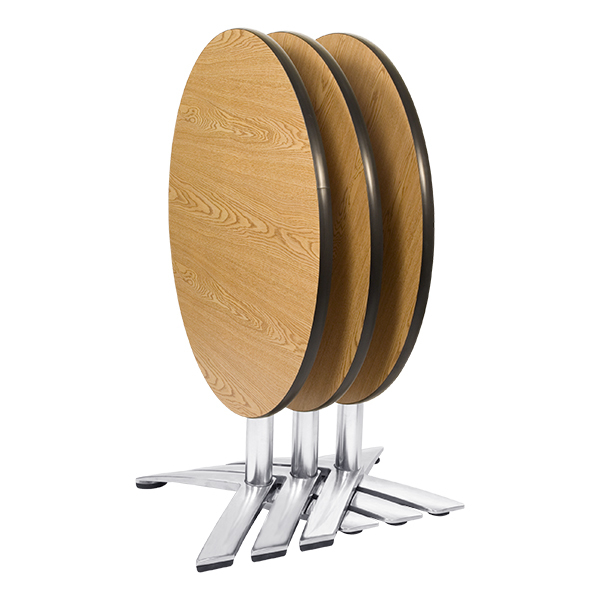 Pedestal lunch tables are square, round or rectangular and range from 24 to 60 inches in diameter, width or length. They can hold up to eight people, but most often hold two to four. When it comes to table spacing, there should be at least 54 inches between all round tables, 60 inches between square or rectangular tables and 48 inches of aisle space. Most lunch and café tables are stationary, but you'll find some that fold up or disassemble to make storage easier. If you'll be changing your room layout often, you might want to consider one of these types of tables. Fold-up café tables have pedestal legs that fold together, a top that flips down and can take up as little as 12 inches of floor space. Knockdown tables disassemble into three pieces: the top, the base and the column. These components take up less storage space than an entire table alone. Nesting café tables have a top that flips down like a fold-up table, but their legs are designed to nest together to save space, rather than fold up. Click here to see our selection of pedestal tables. If you still have questions after browsing, our sales team is happy to help—call us at 1-800-260-2776.